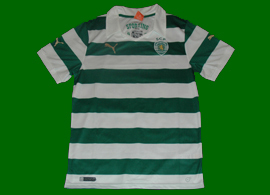 In the last year of the extension of the contract with Puma, the hooped sporting Lisbon shirts are again excellent. Very similar to those of two years before, the main outside difference is the collar, that was round in 2011/12. However, one major drawback of this season's shirts is that the "green hole" in the back returned, interrupting the hoops. A special version of the shirt was done, with a tribute to the team that won the Cup Winners Cup 50 seasons ago, in 1963/64. On the inside of the collar, there was a photo of that team, and also the details of the final game against MTK Budapest, in which Morais' corner kick goal led to European glory. 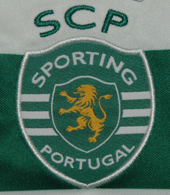 Again, and for the fourth season, one problem is the green colour used, which is, too blue to be "Sporting Lisbon green". After one year without the split green/white Stromp jersey, it returned, at least in the official presentation of the new kits. It is the same model as worn in 2010/11 and 2011/12, but it is always positive to have the most classic of Sporting shirts. After the orange, the away kits are again in a colour not normally associated with Sporting Lisbon away shirts. We show more photos of the new shirt here. And see here: Fantasy kits of the new Sporting Lisbon shirt 2013/14 - alternative sponsor. Click here to see all the Sporting Lisbon jerseys from 2012 2013. Click here to see the new Sporting Lisbon shirts.